For the first time ever in the clubs 20-year history, the Chiefs performed a pre-match haka ahead of their game against Wales. The Chiefs went on to win the game 40 -7! The Chiefs (formerly known as the Waikato Chiefs and officially called the Gallagher Chiefs) are a professional rugby union team based in Hamilton, New Zealand. Their primary home ground is Waikato Stadium. The Chiefs play in black, red and yellow coloured jerseys. The team competes in the Super Rugby competition, previously known as the Super 12 from 1996 to 2005 and Super 14 from 2006 to 2010. The Chiefs are one of the competition's five New Zealand sides. The Chiefs were founded in 1995 as the Waikato Chiefs for the inaugural Super 12 season in 1996.In 2000 the Chiefs won 3 of their regular season games and finished the regular season in 10th place. 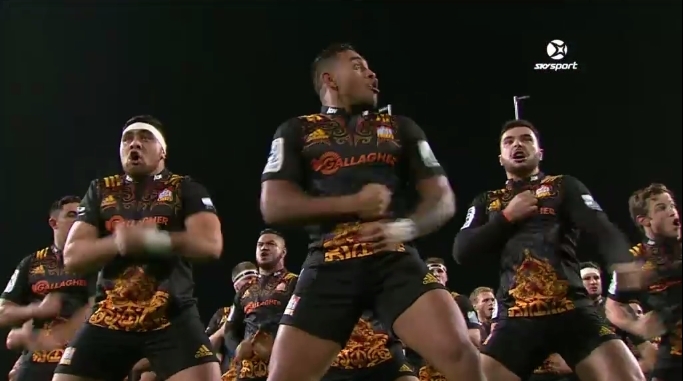 Responses to "The Chiefs Rugby team performs a passionate pre-game haka against Wales"